Well my hand is coming along fine, still bandaged but with a lot less than what was on there. Can't believe it was a week ago today. I am able to move my finger much better now and it doesn't lock when I try to bend it. Although it still swells and get stiff that will be like that for sometime. If you never thought you have seen enough purple shades you should see my hand. For one small finger somehow I have a bruised palm, little finger and middle finger. Must be all that tugging he did to release that tendon. Anyways before surgery I had basecoated some things and got the real messy work, like spraying and doing backgrounds. 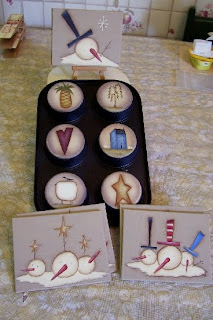 Below is a pic of some canvases that you can hang around the house or on a knob of a cupboard over the holidays. A 6 pack muffin tin baking pan, I did one with ginger faces also, it will have homespun attached to hang it on a kitchen or wall somewhere. Here are 2 painted ornies I did from the Quick and Easy painting magazine Ornament issue for 2009. 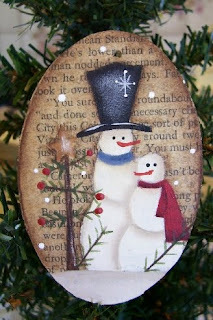 The wood I cut out then attached a book page and painted these cute snowmen and a tree. As you can see this is hot off the press so I didn't add the hanger yet. And this is a Kim Klassen design, that is how I got the idea to paint these on book pages. I used another template from the Q&E mag and cut the ornie shape out, applied a book page then painted, then added a lacy scrapbook border at top, painted the sides and back with Folkart Inca Gold and then put a screw eye in at the top and tied a piece of organza gold ribbon. I really like this idea of painting on book pages. I am on a roll now. Seems it was taking me forever to decide to do this fall show, I was ready to pack it in but Christmas time is always nice to have a few extra dollars. I also have a house I painted on a bookpage too but somehow I didn't resize it to upload. Oh well you get the gist. Hope you are all well and not too busy with return of school and such. Hard to believe it is September. Where did August go??? so glad that your hand is feeling better..these are really pretty.. should do well for you.. love the shape for the church one.. and those little melted snowmen are adorable.. pics look great.. I really like your paintings. Just darling. My word is "primlicious" LOL My friends make fun of me, but it's perfect I think. LOL :) Keep up the neat work, love dropping by. Have a great holiday weekend. Thank you PammyJo and Kathy. You both have a great long weekend as well. I am in full paint mode now. I wonder where you get your wonderful talent from? I love the snowmen! I have a large quantity of canvas that you must remind me to give to you. Just lovely!! Love your snowmen canvasses and those ornies are fab!! Glad to hear you hand is feeling better too! 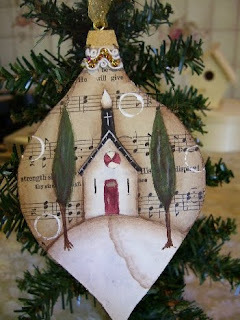 Great Folk Art the ornament I love them this give me some ideas for my plain Christmas ornaments just sitting here on my design desk. These are so coute! Nothing stops you, Les! You're incredible.